I love the “artsy” look that textures can add to photographs. Sometimes, I get carried away when I use them myself. And I go through spells when I use them a lot. Today, my focus in some tips for applying textures to images. 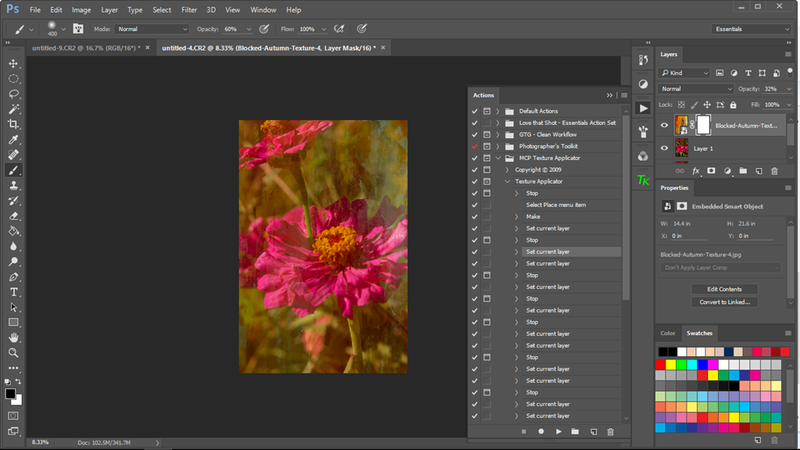 I confess: I “cheat.” I use the MCP free Texture Applicator action to apply textures to images. It’s easy to use: just a few clicks, and the texture is imported into Photoshop and placed over the image; then drag the corners to resize if needed, double-click on the image, and the texture is placed. Of course, there are some tweaks—blending mode, opacity, and the like. The MCP action creates a layer mask with the defaults of white and black for the brushes. The idea is that you can brush off the texture with a black brush over the places where you might not want texture, such as over skin in a portrait or perhaps over the flower in a “portrait of a posy.” But there are other ways to handle textures. I’m going to play with this image today. As usual, I made basic edits in Lightroom to adjust white balance, set the white and black points, and tweak the contrast, saturation/vibrance, and the like. Then I sent it into Photoshop CC for the final edits. 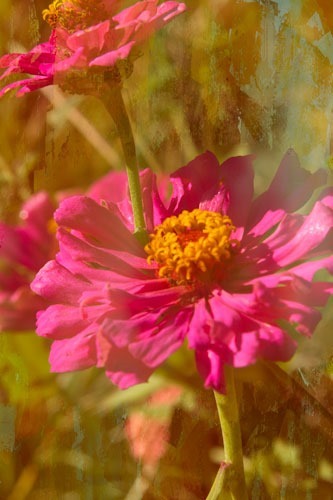 I want to add some fall color to this image as this is probably some of the last of the zinnias that will bloom in my little garden before frost. I don’t really need texture because the background has plenty of it. I want the texture to create a mood, though, that is not present in the original. I am using one of Jai Johnson’s blocked texture from the Autumn Collection pack that is part of the the Design Cuts bundle deal. There are some gorgeous textures and patterns in this bundle. Already, I like the look. 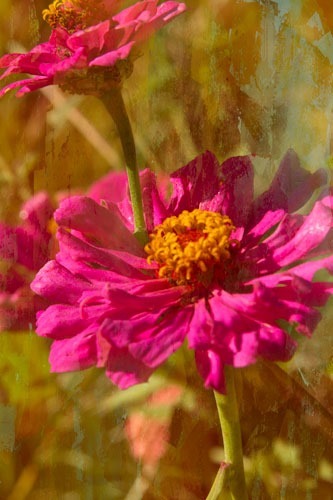 It’s painterly, and I love that look for floral images. But do I really want all that texture on the flowers themselves? This is where it’s fun to get creative. First, I am going to experiment with the blend modes. It’s set for normal right now with an opacity of 32%, which allows the original image to be seen through the texture layer. For this image, I like the Screen mode at about 50%, but I want more of those magenta/purple zinnias to show. I can do a couple of things. I can lower the opacity of the brush to something like 20 or 30% and retain some of the texture and the color, or I can removed the texture and color all together. There is a third technique as well that softens the texture while retaining some of the color: using a filter layer with Gaussian blur. I’ll show you the results of each. First, here is the result when I brush off the texture at about 30% opacity. It still retains the texture that gives it a more “autumn” look with the oranges and golds, but more of the color of the flower comes through. 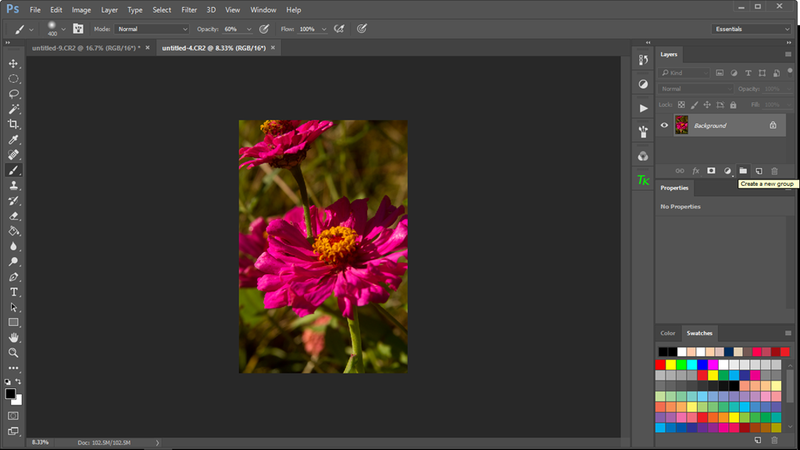 This version removes the texture but retains the color by applying a Gaussian blur selectively over the flower itself. When you use this method, be sure that you click on the texture thumb nail in the texture layer. Use the lasso tool and draw around the subject; you don’t have to be exact. Select Filter>Blur>Gaussian Blur from the top menu. Use the Radius slider and pull to the right until the preview is smooth. I went up to about 55 pixels. Then click okay. More of the color of the texture layer is retained but there is less texture on the main flower. I still have painterly look but with a more muted flower color. I could go back to the layer mask and brush out some of the color as I did with the image above, or I could lower the opacity of the layer itself. It’s your personal taste and your vision for the image.